Handy around the shop. 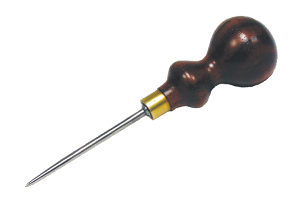 The Awl can be used to mark the center point of wood so the drive center locates accurately. It can also be used for scribing lines. The Awl is great for probing into possible rotten areas in blanks.The handle is made of Rosewood and is fitted with a brass ferrule to keep it from splitting. Overall length is 5" with a blade length of 2-1/2".